If the reader's objective is education or preparation for an exercise, then reading this article in its entirety is recommended. However, this article may also be used for readers who may be seeking information during a true event to obtain essential points quickly without a great deal of time spent exploring the underlying concepts. If you are in the midst of an actual event, go to the staff safety section first, then to instructions on setting up your receiving area and how to use a Geiger counter. Ionization occurs when sufficient energy is transferred to an atom to liberate an orbital electron generating an electrically charge ion pair. These ion pairs can then chemically react with other pathways within living cells and, if sufficient in number, will disrupt cellular function, including damage to DNA. On the electromagnetic spectrum, only x-rays and gamma rays contain sufficient energy to cause ionization. High-energy particles can also cause ionization. Energy can travel through space in the form of electromagnetic radiation. Electromagnetic radiation is composed of massless waves of oscillating electric and magnetic fields. In a vacuum, these waves move at a constant speed, the speed of light (3 X 108 m/s). All electromagnetic waves propagate with characteristic wavelength and frequency, with the wave's energy being directly proportional to frequency and inversely proportional to wavelength. Within the electromagnetic spectrum, only x-rays and gamma rays have enough energy to produce ion pairs. The remaining waves within the spectrum, such as microwaves and radiowaves, are nonionizing. Ionizing radiation can also be in the form of particulate radiation, which includes subatomic l charged or neutral particles traveling near the speed of light and therefore with high very high kinetic energy. Since particles have mass, they are less penetrating than electromagnetic waves and deposit their energy readily. This property makes them easier to shield but also more hazardous if ingested. Alpha particles are charged particles made up of 2 protons and 2 neutrons—essentially the nucleus of a helium atom. Because of their relatively large mass and positive charge, alpha particles are highly effective in transferring energy to tissue but are also easily blocked by a piece of paper or clothing. These particles are only a concern when alpha-emitting isotopes are ingested or inhaled. Beta particles are high-energy electrons. As in alpha radiation, the main hazard with beta particles lies with internal exposures. With significant skin exposure, however, beta particles have sufficient energy to cause cutaneous burns, "beta burns." Neutrons are electrically neutral subatomic particles that can be liberated in a particle accelerator, a nuclear reactor, or a nuclear weapon as part of the fission process. Neutron exposure is most consequential in a nuclear reactor criticality accident or during nuclear weapons detonation. Protons are positively charged subatomic particles that make up a major component of cosmic radiation originating from the sun. All but a small amount of the sun's proton radiation is deflected by the earth's magnetic field. Radioactive decay is the process in which unstable atomic nuclei assume a more stable configuration by emitting particles with kinetic energy (alpha or beta particles) or electromagnetic waves (gamma rays). Radiological half-life is a physical property of each radioisotope and reflects the stability of the nucleus. Measured half-lives can range from fractions of a second to billions of years. Biologic half-life is the time required for the body to eliminate one half of the material by natural biological means. Effective half-life is the time whereby half of the radioactivity of a particular radioisotope is eliminated as a result of the combined action of radioactive decay and biological elimination. Irradiation is exposure to ionizing radiation. For example, patients who receive x-rays or CT scans become irradiated. Once the radiographic machinery is turned off, radiation is no longer produced. Because these individuals are only in the path of radiation energy, as opposed to carrying a radioactive source on their bodies, they pose no radiation exposure risk to others. Contamination means radioactive material is physically present where it is unwanted or unexpected. External contamination is when unwanted radioactive material is deposited on clothing, skin, hair, or any area where the material has not been taken inside of the body. Internal contamination is when unwanted radioactive material is deposited within the body by absorption through skin, ingestion, inhalation, or through wounds. Incorporation of radioactive material occurs when internal contamination enters metabolic pathways. Radioactive atoms are chemically indistinguishable from nonradioactive atoms. They participate in the same chemical pathways and are difficult to remove once incorporation occurs. Decontamination is any steps taken to remove radioactive material from clothing and the external surfaces of the body or from rooms, building surfaces, equipment, or other items. Decorporation is the processes by which radioactive materials are mobilized from tissues and organs and removed from the body by enhanced excretion. Radiation dose is the quantity of energy deposited in living tissue by an exposure to ionizing radiation. The Gray is the standard SI unit for dose and is expressed as J/kg. The Rad is the more historical unit and is commonly used. One gray is equal to 100 rad. The biological effect of different types of radiation vary significantly. For instance, alpha particles tend to deliver 20 times the biological effect of an equivalent dose of gamma radiation. The equivalent doses are expressed in Sieverts (Sv) in SI units and Rem in classical units. Ionizing radiation interacts with air generating electrically charged ions in the air. Geiger counters are designed to detect this phenomenon, and exposure rates are typically expressed as Roentgens per hour (R). The principal pathologic effect of ionizing radiation results from damage to DNA. Regardless of the form of ionizing radiation, the common pathway of injury is that the radiation deposits a relatively large amount of energy into the electron orbitals of atoms in the biologic medium. This energy transfer raises the energy level (excites) of the electron and, if sufficient, ejects the electron from the atom, resulting in a now positively charged atom (ionization). Early effects of radiation are seen after large doses of radiation are delivered over short periods and especially affect rapidly dividing, self-renewing organs including skin, bone marrow, and gut epithelium. Clinical syndromes reflect the failure of replenishment of tissues with rapid turn over and include acute radiation sickness and radiation burns. They are typically seen within a short period following a massive exposure. Late toxicities, such as cataract formation and cancer, may appear months or years following an exposure. Other delayed effects are seen in organs with slowly dividing or quiescent, terminally differentiated cells such as the central nervous system, kidneys, and liver. Many of these late radiation effects are attributable to a combination of parenchymal cell death and microvascular disease. Exposure to ionizing radiation is an unavoidable fact of life on earth and has been a reality since the beginning of time. The various natural sources include cosmic rays from the sun and stars, radioactive elements in granite and other rocks, and radioactive elements that compose living tissue, predominantly potassium-40 and carbon-14. In addition, radioactivity exists in the environment from fallout from nuclear explosives testing, from both coal and nuclear power plants, and industrial accidents including Chernobyl in 1986 and the current nuclear reactor disaster in Fukashima, Japan. Finally, medical use of ionizing radiation is a growing source of exposure, although this exposure is generally limited to the individuals undergoing the various diagnostic studies and therapeutic interventions. The question of the relative benefit and the hazard of ionizing radiation is beyond the scope of this article, and current regulatory standards are used as a basis for operational practicalities with some extrapolation to address the gaps for the unknown. Regulatory agencies set standards for the lawful use of radioactive material to keep exposure doses as close to background as feasible and within specified maximum guidelines. Such guidance highlights the principle that the risk of health effects of exposure to ionizing radiation must be balanced by the expected individual and societal benefit to justify exposure beyond natural background. It is clear that the severity of toxicity caused by radiation is directly related to the quantity of energy deposited into the living organism and the subsequent disruption of metabolic and reproductive pathways. Exposure to high doses of ionizing radiation results is acute illness and potentially death. Low-level exposure may lead to relatively minor toxicity acutely and possible adverse health effects in the future. The linear no-threshold model (LNT), which is used by most regulatory agencies, assumes a direct and proportional relationship between radiation exposure and cancer risk with all radiation doses. These risks are derived from the linear relationship between radiation doses and health effects (mostly cancer) in the atomic bomb survivor studies. However, at low exposure doses, the high natural incidence of the disease masks any additional effects that may have been caused by radiation. Because of this, the LNT assumes that cancer incidence as it relates to radiation dose behaves in the same way as at higher doses; that is, in a linear manner. However, there is little conclusive direct evidence of adverse health effects at doses below 100 mSv, questioning the certainty to the LNT risk model. Some experts postulate that the actual hazard at low radiation doses is lower than those predicted by LNT. Whether the actual effect is linear or otherwise remains unknown, and the core principle of radiation safety is to ensure that radiation levels are kept as low as reasonably achievable (ALARA). In light of this uncertainty and given the uncontrolled nature of a contamination radiological event, current guidance for immediate response to an emergency focuses first on prevention of very high-dose exposures; next, on promptly recognizing and controlling levels of contamination that may progress to acute health risks if not immediately controlled; and then, if feasible, on evaluating and managing lower levels of contamination and exposures near to background levels. Localized exposure to high doses of radiation may cause cutaneous injury similar to burns. Blistering, erythema, desquamation, and ulceration often present about 12-20 days after irradiation with the onset and severity related to the magnitude of exposure. A local exposure of 3 Gy leads to epilation within 1-2 weeks. A local exposure of 6 Gy may cause immediate signs of burn. Greater exposures of 10-15 Gy lead to dry desquamation, and exposures of 20-50 Gy lead to wet desquamation (partial-thickness burn) within 2-3 weeks. 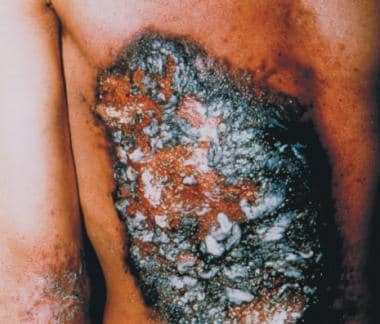 For doses greater than 50 Gy, a cutaneous syndrome of necrosis and ulceration may occur from damage to endothelial cells and small blood vessels. Vascular complications may present months to years after exposure. The acute radiation syndrome (ARS) occurs after whole-body exposure to a large dose of ionizing radiation. This syndrome includes a number of characteristic signs and symptoms whose severity depends on magnitude of dose and duration of exposure. ARS, by definition, does not occur at doses less than 1 Gy and is uniformly fatal at doses greater than 10 Gy. The estimated LD50/60 (the dose at which 50% of those exposed die within 60 days) is 3.5 Gy for humans without medical treatment and roughly 7.0 Gy with treatment. Acute radiation syndrome (ARS) has been described according to progression of illness through 4 stages: (1) prodrome, (2) clinical latency, (3) manifest illness, and (4) recovery or death. The prodromal symptoms occur shortly after irradiation, with the dose of exposure determining severity, duration, and onset. Common prodromal symptoms include nausea, vomiting, anorexia, fatigue, diarrhea, abdominal cramping, and dehydration. At doses of greater than 10 Gy, those exposed show symptoms within 5-15 minutes; at lower doses such as 2-3 Gy, symptoms can take up to 12 hours to present. Immediate diarrhea, hypotension, and fever indicate a supralethal exposure. Severe and early onset of prodromal symptoms indicates higher dosage of exposure and a poor prognosis. Progression through the other phases depends on dosage of exposure. Acute radiation syndrome (ARS) is further described by its 3 classic subsyndromes: the hematopoietic syndrome, the gastrointestinal syndrome, and the cerebrovascular syndrome. The hematopoietic syndrome typically occurs after exposures of 2-5 Gy. At these doses, lymphocytes die from radiation-induced apoptosis, and precursor cells in the bone marrow are destroyed preventing new production of leukocytes and platelets. During the period of a few weeks (clinical latency), circulating cells die off with no replacements; it is at this nadir that the full syndrome becomes clinically apparent with development of infections and possible hemorrhage. Anemia from red cell depression usually does not occur alone in the absence of hemorrhage. Early supportive care, treatment and prevention of infections, and the consideration of cytokine therapy are all important aspects of care for this subsyndrome. However, even if the hematopoietic syndrome is treated, death commonly still occurs from multiorgan failure. The gastrointestinal syndrome usually occurs after exposures of more than 5-12 Gy. Irradiation leads to death of intestinal mucosal stem cells in the crypts. After loss of mucosal cells at the villi through normal functioning, the stem cells are unable to produce new cells, leading to denudation of the GI tract. As the normal GI boundary is compromised, bacterial growth proliferates increasing the risk of sepsis. Common symptoms include anorexia, nausea, vomiting, prolonged bloody diarrhea, abdominal cramps, dehydration, and weight loss. Often the prodrome onset is rapid, followed by a latent period of roughly 1 week followed by the return of symptoms. The mainstays of treatment are maintenance of fluid and electrolyte balance and infection prevention. Nevertheless, despite treatment death often follows in 3-10 days. The cerebrovascular syndrome occurs after exposures of very high doses (>30 Gy) and is uniformly fatal. At doses of greater than 100 Gy, death occurs within hours. Although the exact mechanism of death is not fully understood, vascular damage is thought to lead to significant cerebral edema, producing neurologic and cardiovascular collapse. Immediate symptoms include nausea, vomiting, hypotension, ataxia, and convulsions. Death follows within a few days. That being said, the only way to respond safely and intelligently is with properly functioning radiation monitoring equipment. While all hospitals have some access to equipment, it is absolutely essential that appropriate equipment be immediately available in the emergency department and that staff are sufficiently trained to perform basic radiation surveys 24 hours a day, 7 days a week. During the unknown early phase of a disaster, staff must observe an all-hazards approach and assume that biological, chemical, and radiological hazards may be present. Only after other hazards are excluded should staff limit their focus to radiological hazards. Protection should focus on minimizing external exposure and preventing inhalation, or inadvertent ingestion. In most cases, protection is accomplished by observing standard precautions, also referred to as level D personal protective equipment (PPE), generally observed in the hospital setting. Basic radiation surveillance should focus on identifying the presence of radiation, protecting staff and patients, and controlling the spread of contamination. Once available, radiation specialists should be able to characterize the hazards more specifically. Optimally, all personnel entering or working in a radiation control zone should wear personal dosimeters. In the early phases of a disaster, this may not be feasible, in which cases, dose estimates will need to be reconstructed. Under all circumstances, radiation exposure should be kept as low as reasonably achievable (ALARA) while preserving critical operations and resources. Additionally, during an uncontrolled situation, providers should observe universal precautions, including splash and water protection. Furthermore, staff actively attending contaminated patients should wear personal monitors, such as real-time dosimeters and/or film badges, unless the level of exposure is known to be negligible. Radiation protection agencies assume that even the smallest exposure to ionizing radiation has an incremental albeit small probability of causing a long-term effect, such as cancer. For example, there is a hypothetical risk of cancer from receiving radiation from a single chest x-ray, the risk is so small that it impossible to statistically prove this. The annual background radiation dose is equivalent to about 12-15 chest x-rays a year, and this is considered a normal yearly exposure. Other activities, like smoking or airline travel, can increase one’s annual dose of radiation. Medical tests, especially imaging using radiation, also increase the dose of radiation exposure. The hazard is thought to be very small relative to the expected benefit of the test. On the other hand, very high radiation doses received in a short period may cause serious illness and even death. The dose range where acute effects are seen are equivalent to the dose one would receive from several thousand chest x-rays. The radiation doses to staff members involved in an emergency response are expected to be well below these thresholds and well within the annual range of radiation exposures established by radiation protection agencies. Emergency services personnel should initiate their incident command structure as soon as a radiation event is suspected. They should secure the scene, ensure self-protection, and attempt to rescue injured or ill victims while minimizing radiation exposure to all individuals, including the rescuers. Personnel should wear appropriate protective gear prior to arrival at the scene and follow the guidance of the radiation safety officer or operations commander. Clinical operations may be required in high exposure areas, but exposure limits should be strictly regulated by supervisors. In the field, it is far more important to detect the presence of abnormally high radiation fields than to identify specific contaminants. Personal radiation monitoring instruments should be worn by all personnel with alarm points pre-set by radiation specialists. Reasonable set points for individuals not performing life-saving or critical interventions are >100 mR/h, with 500 millirem as the total cumulative dose. Once the scene is assessed to be safe for entry, rescue personnel should assess and treat life-threatening injuries. Conventional injuries and illnesses present a much greater acute hazard to patients than radiation exposure and contamination; therefore, standard medical treatment should be initiated as soon as feasible and not delayed to assess contamination status. Contamination control can be accomplished by removing the victims clothing and wrapping in clean sheets, but this should not delay resuscitative care. In contrast, if a contaminated patient has a non–life-threatening or serious condition, they should be optimally decontaminated prior to definitive medical treatment. In a mass casualty event, individuals who are neither contaminated nor ill or injured should go home and take a regular shower with soap and shampoo. They should bag and store their potentially contaminated clothing in a safe place. Decontamination at or near the site of exposure would be useful if feasible. However, such interventions are not feasible when dealing with a large number of frightened individuals in the early moments of a catastrophe. Generally, individuals leave a hazard scene quickly and self-present to hospitals. Therefore, hospitals must be prepared to deal with large numbers of contaminated and potentially contaminated victims. Emergency departments should activate their institution's Hospital Incident Command Structure (HICS) as soon as they are notified of an event. The Joint Commission on Accreditation of Healthcare Organizations requires all hospitals to maintain a written protocol for receiving and treating victims of radiation disasters. In general, treatment of conventional injuries and illness takes precedence over radiation concerns because the quantity of radioactive material that a contaminated individual carries on his or her body is unlikely to present a significant radiation risk to either the patient or to the healthcare staff attending to the patient. Healthcare workers have cared for contaminated individuals in the past, and there are no documented cases of healthcare personnel becoming acutely ill caring for contaminated or irradiated victims of radiation accidents. Therefore, critically ill and injured patients should be moved into critical care areas of the hospital and should be decontaminated during resuscitation. The medical emergency (red) category comprises patients who are seriously ill or injured and require immediate attention. Initial management is to bypass the decontamination shower; remove the patient’s clothing and cover with a clean sheet while moving into the critical care area. Medical urgency (yellow) patients should undergo rapid radiologic triage. They should be decontaminated as completely as feasible before entering the yellow area. Ambulatory with or without minor illness or injury (green) patients should proceed directly to thorough radiologic survey if indicated. If the number of victims is small, a thorough evaluation using a hand-held survey meter should be performed on all individuals according to procedures suggested by REAC/TS. However, in a mass casualty incident, it is likely that too many patients will require screening in a short period of time to allow performance of a thorough screening, and a radiologic screening triage will be needed. If feasible, a portal monitoring system should be set up for screening large numbers of individuals with low probability of significant contamination. For an explosive incident, patients seriously injured were most likely closest to the blast, with the highest levels of radiation exposure. These patients will probably require hospital admission, which will allow clinicians ample time for patient observation and assessment of internal contamination and radiation-dose exposure analysis. Note: Open wounds must be rapidly assessed to exclude high-activity fragments. As in the case of the more seriously injured patient, these individuals are at a higher risk of radiation contamination due to their proximity to the incident. While these patients may not require hospital admission, they may require assessment for radiation contamination and exposure. Facial and upper body contamination may indicate that the patient inhaled radioactive contamination and may have internal contamination that requires treatment. Exposure to radioactivity poses greater risk for these patients (in the case of pregnant women, for the fetus). Decontamination therefore has heightened importance for them, and their care should be prioritized accordingly. Direct these individuals to an alternative care area to obtain demographics, counseling, and assessment. Time to emesis (TE) correlates with exposure dose, decreasing as exposure dose increases. For TE less than 1 hour, whole-body dose estimates are greater than 4 Gy. For TE between 1 and 2 hours, whole-body dose is estimated to be greater than 3 Gy, and for TE greater than 4 hours, whole-body dose is estimated to be around 1 Gy. The most useful laboratory test in the setting of acute radiation exposure is the serial complete blood count with differential obtained every 6-12 hours. Lymphocyte count serves as an indicator for prognosis and as an estimate for the dose of radiation received. Patients with a minimal lymphocyte count (MLC) of 1000-1499/mm3 have an approximate absorbed dose of 0.5-1.9 Gy. Although these patients may have clinically significant effects, their prognosis is good because the absorbed dose is usually nonlethal. Patients with MLC of 500-999/mm3 have an approximate absorbed dose of 2.0-3.9 Gy with severe injuries and fair prognosis. An MLC of 100-499/mm3 coincides with an approximate absorbed dose of 4.0-7.9 Gy predicting severe injury and a poor prognosis, and those with MLC less than 100/mm3 have an estimated absorbed dose of greater than 8 Gy and have a high incidence of death despite bone marrow stimulation. Survival has not been documented for those exposed to greater than 10 Gy. Blood can also be drawn for cytogenetic evaluation. If dicentrics (chromosomes with 2 centromeres) are found, they can be used to indicate extent of radiation exposure. Cytogenetic studies are time-consuming processes that are currently not being used for mass screening strategies. Realistically, these studies may be more useful from an inpatient standpoint with expert guidance. Patients with localized irradiation who present with cutaneous injury should be treated in the same manner as those with thermal burns. Pain control and infection prophylaxis are the mainstays of treatment. In the cases of severe burns, vasodilator therapy, grafts, or amputations may be necessary. The images below show burns due to radiation exposure. Early erythema in the frontal and antelateral right side of the chest 5 days after the exposure to an iridium-192 source (185 GBq, 5 Ci) mounted in a pen-size sourceholder for industrial radiography, which was placed to the pocket of the worker's overall and kept there for about 2 hours. Image courtesy of the WHO. Early erythema 11 days after exposure. Image courtesy of the WHO. Desquamation and skin necrosis 21 days after exposure. Note: the white areas correspond to silver ointment. Image courtesy of the WHO. 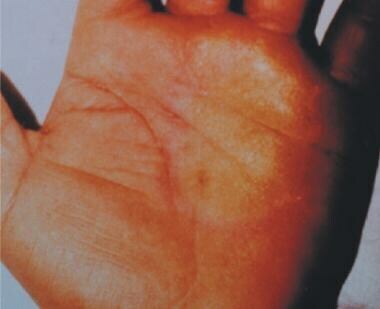 Tense painful bulla of the left palm on day 20 evolving from erythema with early blistering, which had appeared on day 10 after the initial contact for a few minutes with the iridium-192 source. Image courtesy of the WHO. An ulcer in subacute stage and 5 ulcers following self-healing with depigmentation caused by being unawarely exposed 4-8 months earlier to the same164 GBq (4.4 Ci) cesium-137 source (placed in a pocket of a trench coat used as a blanket). Image courtesy of the WHO. In cases of internal ingestion or contamination of unknown radioactive materials, some measures (eg, lavage, charcoal) to decrease absorption may be effective. Similarly, specific therapies exist to remove some internally deposited radionuclide albeit with limited efficacy. These treatments are often in limited supply, complex in action, and associated with significant risks. Thoughtful and critical analysis should occur prior to administration. Internal contamination by radioactive iodine can be treated with a saturated solution of potassium iodide (SSKI), a blocking agent that reduces uptake of radionuclide in the thyroid. SSKI is most effective when taken within a few hours of exposure. In reactor accidents involving radioactive iodine, massive quantities are released into the environment. Both exposed victims and rescue personnel should take SSKI to reduce thyroid uptake of radioiodine to reduce risk of future malignancies. Specific dosages for SSKI administration can be viewed at Guidance for Industry – KI in Radiation Emergencies—Questions and Answers. Chelating agents, such as penicillamine, bind specific radioactive metals causing decreased tissue uptake and increased excretion. Exposure to isotopes of cesium can be treated with ferric hexacyanoferrate (Prussian blue) to decrease gastrointestinal absorption. Agents such as Ca-DTPA and Zn-DTPA can be administered after internal contamination with substances such as americium, curium, and plutonium. Administration of specific agents should be completed in consultation with professionals familiar with these agents. Patients with intractable vomiting should be treated supportively with intravenous fluids, analgesics, and antinausea medication. This supportive treatment should continue until the initial illness has abated. For exposures of around 5 Gy, immunosuppression and bowel dysfunction occur relatively quickly and patients will become ill in a few days. Supportive care includes, antibiotics, consideration of cytokine therapy, and transfusions as needed. For exposures greater than 5 Gy, death from gastrointestinal syndrome is highly likely. Along with antibiotics and platelet transfusions, as needed, all measures to avoid to infection should be emphasized. During periods of infection, antibiotics should be tailored toward the source of infection. If absolute neutrophil count (ANC; see the Absolute Neutrophil Count calculator) is less than 500 cells/mm3, most experts recommend prophylactic antibiotics, including an extended-spectrum quinolone, for coverage of gram-negative and gram-positive infections; an antiviral agent (acyclovir in those with a history of herpes simplex virus); and an antifungal agent. Once fever and infection occur, broader-spectrum antibiotics with additional antipseudomonal coverage should be initiated. In March 2015, the US Food and Drug Administration (FDA) approved filgrastim (Neupogen) to increase survival in patients acutely exposed to myelosuppressive doses of radiation (hematopoietic syndrome of acute radiation syndrome). Efficacy studies of filgrastim could not be conducted in humans with acute radiation syndrome for ethical and feasibility reasons. Approval was based on efficacy studies conducted in animals and data supporting the use of filgrastim for other approved indications. Efficacy of filgrastim was demonstrated in a randomized, blinded, placebo-controlled study in a nonhuman primate model of radiation injury. The planned sample size was 62 animals, but the study was stopped at the interim analysis with 46 animals because efficacy was established. In the study, rhesus macaques were randomized to a control (n = 22) or treated (n = 24) group. Animals were exposed to total body irradiation of 7.4 ± 0.15 Gy delivered at 0.8 ± 0.03 Gy/min, representing a dose that would be lethal in 50% of animals by 60 days of follow-up (LD50/60). Starting on day 1 after irradiation, animals received daily subcutaneous injections of placebo (5% dextrose in water) or filgrastim (10 mcg/kg/day). Blinded treatment was stopped when one of the following criteria was met: ANC ≥1,000/mm3 for 3 consecutive days, or ANC ≥10,000/mm3 for more than 2 consecutive days within study day 1 to 5, or ANC ≥10,000/mm3 any time after study day 5. Animals received medical management consisting of IV fluids, antibiotics, blood transfusions, and other support as required. Waselenko et al proposed recommendations for giving colony-stimulating factors (CSF) to victims of radiation exposure. His team recommended giving granulocyte-macrophage colony-stimulating factor (GM-CSF) to those who receive more than 3 Gy of radiation and in those with multiple injuries who are exposed to more than 2 Gy. Recommended doses include initiating therapy with filgrastim at 5 mcg/kg/day or sargramostim at 250 mcg/m2/day subcutaneously immediately after exposure and continuing until absolute neutrophil count increases to greater than 1000 cells/mm3. Alternative treatment with subcutaneous pegfilgrastim weekly to those greater than 45 kg has also been suggested. Pegfilgrastim (Neulasta) is also approved for H-ARS in adult and pediatric patients. Sargramostim (Leukine) is approved by the FDA for H-ARS for treatment of adults, and also children aged birth through 17 years. It is indicated to increase survival of myelosuppressive doses of radiation. Sargramostim is available in 2 forms for parenteral administration. The sterile ready-to-use solution may be administered without further dilution as a subcutaneous injection. Note that this preparation contains benzyl alcohol; therefore, it is not suitable for neonates or infants owing to the risk for gasping syndrome in this population with benzyl alcohol-containing products. Use only the lyophilized powder that must be reconstituted with sterile water for injection without preservatives for neonates or infants. Obtain a baseline CBC with differential and then serial CBCs approximately every third day. The weight-based dose is administered once daily until the ANC remains >1000/mm3 for 3 consecutive CBCs. In May 2018, the FDA cleared emergency use of the investigational biologic RLX-R18 (Pluristem Therapeutics, Inc.) to treat acute radiation exposure in a nuclear event. Full FDA approval will depend on the results of a phase III clinical trial. Radiation portal monitors can be set up to screen large numbers of patients with low suspicion of contamination. Those patients with high risk of contamination should be decontaminated empirically or screened with a Geiger counter with special attention to detecting high-activity particles. Radiation portal monitors can be used in a fashion similar to security screens performed in airports. Individuals should enter the portal frame and step on a footplate activating the monitor. Individuals should then turn sideways to enhance detection of very small sources. Portal monitors can generally detect as little as 1 microcurie of Cs-137, and the relevance of detecting such a low level of activity in a mass casualty situation is questionable. Since the portal monitor’s main role will be to rapidly and reliably clear a large number of people as not contaminated, it is essential to avoid contaminating the portal monitor or the area immediately in the vicinity of the monitor. Anyone at high or intermediate risk of contamination should either undergo screening with a Geiger counter or be decontaminated empirically. Position the Geiger counter with the meter away from you. Locate and open the battery compartment. Put the batteries in the meter using proper orientation (up/down). Close and latch the battery compartment. Check the batteries using the "range" switch or "bat" button; the method depends on the type of instrument. The meter needle should move to area on the scale marked battery; this indicates that the batteries are good. If the batteries are not good, find a flashlight or other source of 2 D-cells and place them in the meter; these batteries should be checked as well. Turn the "F/S" switch to "S" (Slow). Turn the "audio" switch to "ON." Ensure that the "F/S" switch is on "S" (Slow). Adjust the range switch to the most sensitive position. Remove the probe cover, as necessary. Measure the background radiation for 60 seconds, and write down this reading. Background radiation varies with time; therefore, it may be necessary to take several count readings and average the results. Record this reading as well. A reading of 40-100 counts/min or a reading of approximately 0.02 mR/hr (ie, 0.2 on the 0.1 range setting), or 0.2 micro Sv/h, is expected. The person being surveyed should stand on a clean pad. The person should stand straight, with feet spread slightly and arms extended with the palms facing up and fingers pointing straight out. Move the "F/S" switch to "F" (fast response). Set the instrument selector switch to the most sensitive range of the instrument. Hold the probe approximately 1/2 to 1 inch from the person's skin and systematically survey the entire body from head to toe on all sides. Survey both hands and arms. Repeat the survey with the hands and arms turned over. Start at the top of the head and cover the entire body. Carefully monitor the forehead, nose, mouth, neckline, torso, knees, and ankles. Instruct the person to turn around. Repeat the survey on the back of the person's body. Monitor the person's soles of the feet. Slowly move the probe (about 1 inch per second). The probe should not touch anything. Maintain a constant distance from the person. Pay particular attention to hands, face, and feet. Some Geiger-Mueller instruments cannot detect alpha radiation and some low-energy beta radiation. Because alpha radiation is nonpenetrating, it cannot be detected through even a thin film of water, blood, dirt, clothing, or through probe cover. The presence of radiation is indicated by an increase in count rate or exposure rate above background. Adjust the range of the instrument by moving the range selector switch as needed. Document the time and the radiation measurements. Generally, areas are considered contaminated if they register more than twice the previously determined background level. For incidents involving alpha emitters, if the reading is less than twice the background radiation level, the person is not contaminated to a medically significant degree. If the event circumstances indicate that an alpha emitter (eg, plutonium) or low energy beta emitter could be a contaminant, consult a health physicist. Cover the meter probe with the cap. Insert the Geiger counter back in its case. In the early phases of a disaster, detecting the presence of radiation is more important than quantifying the readings precisely. Radiation specialists may not be immediately available, and front-line clinicians will be required to assume radiation safety roles early in a disaster. Later, when the full radiological support team arrives, more accurate measurements can be made. Until then, the number one priority for radiation safety is identifying, if present, high radiation areas or hot spots from relatively low radiation areas. While it will be very challenging to determine specific radiation levels, efforts should be made to demarcate the radiation control zones that are consistent with safe radiation control practices. Most importantly, it is essential to realize that homogeneous distributions of radiation will not occur. Rather, hot spots should be anticipated with attention to the possibility of highly radioactive fragments such as shrapnel imbedded into patients. Procedures should be instituted to minimize radioactive contamination of the hospital, recognizing that some contamination may be unavoidable. As a general principle, only patients with serious illness or injury should enter the hospital prior to optimal decontamination. Those patients entering the hospital prior to decontamination must have their clinical care and radiation decontamination accomplished simultaneously when possible. Other patients should be treated in other care areas within or near the hospital after optimal decontamination. Patients triaged to other areas of care should not be transferred to the ED unless their clinical condition deteriorates and the alternative care areas are incapable of providing adequate care. Secure entry points with hospital security. Establish a control line at the entrance to the treatment and decontamination areas. Clearly mark the area to differentiate the controlled (contaminated) from the nonradiation controlled (uncontaminated) side. Set up controlled treatment areas large enough to hold the anticipated number of victims. Cover traffic area floors and treatment areas. If time permits, securely tape durable nonslip covering to the floor. Placing floor covering should not delay urgent or emergent medical care. Clearly mark the area to prevent unauthorized entry. Use strict isolation precautions, including protective clothing and double bagging discarded items, clothing, and waste. In addition, establish a buffer area or control line. Monitor anyone or anything leaving the controlled areas. Frequently monitor/survey controlled treatment areas. Frequent environmental monitoring is recommended to ensure that high contamination or hot sources are found and limited. Results of surveys should be posted and visible to all staff. Check survey instruments, including batteries. Surveyor should document background radiation levels. Monitor anyone or anything potentially contaminated within the area and anyone or anything leaving a controlled area. Cover equipment and stretchers. Cover all equipment in treatment areas. Protect stretchers with several layers of waterproof, disposable sheets. Change instruments, outer gloves, drapes, etc, when they become contaminated. Use waterproof materials to limit the spread of contaminated liquids. Do not allow potentially contaminated water to collect in pools or to spread. Mops may simply spread the contamination, and contaminated mops should be impounded. Absorbing small quantities into absorbent pads may be effective. A wet vacuum may be useful to remove pools as well. Limit movements of patients and visitors in radiation control areas. Restrict the movement of patients and visitors within and between controlled treatment areas to limit any unnecessary radiation contamination. Emergency medicine providers will undoubtedly be involved in response to a contaminating radiological event, even if their fluency in the topic remains limited. Similarly, there will continue to be a discrepancy between the best practice perceived by the expert, fluent in all technical elements of a complex industry, and the value of these strategies as perceived by the front-line provider. More than a decade after September 11, 2001, this gap is significantly smaller. Treat life-threatening illness and injury first. Look specifically for high radiation sources (hot particles). Expect early patients to arrive unannounced. Prepare alternative care areas for ambulatory patients seeking radiation screening. Undress and wash potentially contaminated patients. Prioritize care to children and pregnant women. Do not expect to keep all radiation out of the facility. Testimony of Dr. Henry Kelly, President Federation of American Scientists before the Senate Committee on Foreign Relations, March 6, 2002. FAS Testimony on Terrorist Nuclear Threat. Available at https://fas.org/faspir/2002/v55n2/dirtybomb.htm. Accessed: May 3, 2018. Mettler FA. Emergency Room Management of Radiation Accidents. Gusev IA, Guskova AK, Mettler FA, eds. Medical Management of Radiation Accidents. 2nd ed. Boca Raton, Florida: CRC Press; 2001. 437-447. Committee on the Future of Emergency Care in the United States Health System. Hospital-Based Emergency Care: At the Breaking Point. Washington DC: The National Academies Press; 2007. D'Orazio JL, Wilson L, Greenberg MI. A Survey of Philadelphia area emergency departments regarding preparedness for radiation emergencies [abstract]. Clinical Toxicology. 46:643. Becker SM, Middleton SA. Improving hospital preparedness for radiological terrorism: perspectives from emergency department physicians and nurses. Disaster Med Public Health Prep. 2008 Oct. 2(3):174-84. [Medline]. Van Dyke ME, McCormick LC, Bolus NE, Pevear J 3rd, Kazzi ZN. Radiological emergency preparedness: a survey of nuclear medicine technologists in the United States. J Nucl Med Technol. 2013 Sep. 41(3):223-30. [Medline]. Eric J. Hall. Radiobiology for the Radiologist. 5th. Philadelphia: Lippincott Williams & Wilkins; 2000. Baverstock KF. Thyroid cancer in children in Belarus after Chernobyl. World Health Stat Q. 1993. 46(3):204-8. [Medline]. Simon SL, Bouville A, Land CE, Beck HL. Radiation doses and cancer risks in the Marshall Islands associated with exposure to radioactive fallout from Bikini and Enewetak nuclear weapons tests: summary. Health Phys. 2010 Aug. 99(2):105-23. [Medline]. Reiners C, Biko J, Haenscheid H, Hebestreit H, Kirinjuk S, Baranowski O, et al. Twenty-five years after Chernobyl: outcome of radioiodine treatment in children and adolescents with very high-risk radiation-induced differentiated thyroid carcinoma. J Clin Endocrinol Metab. 2013 Jul. 98(7):3039-48. [Medline]. Travis LB, Hill D, Dores GM, Gospodarowicz M, van Leeuwen FE, Holowaty E, et al. Cumulative absolute breast cancer risk for young women treated for Hodgkin lymphoma. J Natl Cancer Inst. 2005 Oct 5. 97(19):1428-37. [Medline]. Kodama K, Mabuchi K, Shigematsu I. A long-term cohort study of the atomic-bomb survivors. J Epidemiol. 1996 Aug. 6(3 Suppl):S95-105. [Medline]. Ushizawa H, Foxwell AR, Bice S, Matsui T, Ueki Y, Tosaka N, et al. Needs for disaster medicine: lessons from the field of the Great East Japan Earthquake. Western Pac Surveill Response J. 2013 Jan. 4(1):51-5. [Medline]. [Full Text]. National Council on Radiation Protection and Measurements. Ionizing Radiation Exposure of the Population of the United States. 2009. Managing Internal Radiation Contamination Following an Emergency: Identification of Gaps and Priorities. [Medline]. [Full Text]. Medical management of acute radiation syndrome and associated infections in a high-casualty incident. [Medline]. [Full Text]. Waselenko JK, MacVittie TJ, Blakely WF, Pesik N, Wiley AL, Dickerson WE, et al. Medical management of the acute radiation syndrome: recommendations of the Strategic National Stockpile Radiation Working Group. Ann Intern Med. 2004 Jun 15. 140(12):1037-51. [Medline]. Rapid Prediction of Hematologic Acute Radiation Syndrome in Radiation Injury Patients Using Peripheral Blood Cell Counts. [Medline]. U.S. FDA Clears Pluristem’s IND to Treat Victims Exposed to Acute Radiation. Pluristem Therapeutics Inc. 2018 Apr 30. Available at http://www.pluristem.com/wp-content/uploads/2018/04/ARS_IND_final_isa.pdf. Ofir R, Pinzur L, Levent A, Aberman Z, Gorodetsky R, Dieter Volk H. Mechanism of action of PLX-R18, a placental-derived cellular therapy for the treatment of radiation-induced bone marrow failure (abstract). Blood. 2015. 126(23):2417. [Full Text]. Radiation Emergency Assistance Center/Training Site. How to detect radiation/How to survey. Available at http://orise.orau.gov/reacts/guide/detect.htm#How to Survey. Accessed: February 2011. Leukine (sargramostim) [package insert]. Bridgewater, NJ: Sanofi-Aventis U.S. LLC. 2018 May. Available at [Full Text]. Sections of this article are adopted from the NYC Hospital Guidance for Responding to a Contaminating Radiation Incident, which was supported by Grant Number U3RHS05957-01-00 from the Health Resources and Services Administration. The contents of this article are solely the responsibility of the authors and do not necessarily represent the official views of any government agency.